You would probably know the basic items you will need on your trip, i.e. your toothbrush, medication, etc. When heading out on a safari, make sure you carry mosquito repellent as well. You are likely to encounter different types of bugs in Tanzania, especially if you are planning to camp out. To make the trip truly memorable, carry your camera with you and check that there is enough memory space. Carry an extra memory card or a USB. Also, make sure there are plenty of batteries, in case the camera runs out of power. Just to be on the safe side, carry a flashlight or torch with you. Also, it won’t be a bad idea to carry a pair of binoculars so you can view the wildebeest up close, especially the ones you cannot get too close to. The best option for you is to have a backpack, and pack it light. You don’t want to be lugging around heavy luggage when trekking on your safari. It will only slow you down, and not to forget, could cause neck and backache, which would ruin your experience of the trip. Obviously, a majority of your luggage will be made up by your clothes and footwear. This is where you have to be careful and cautious. 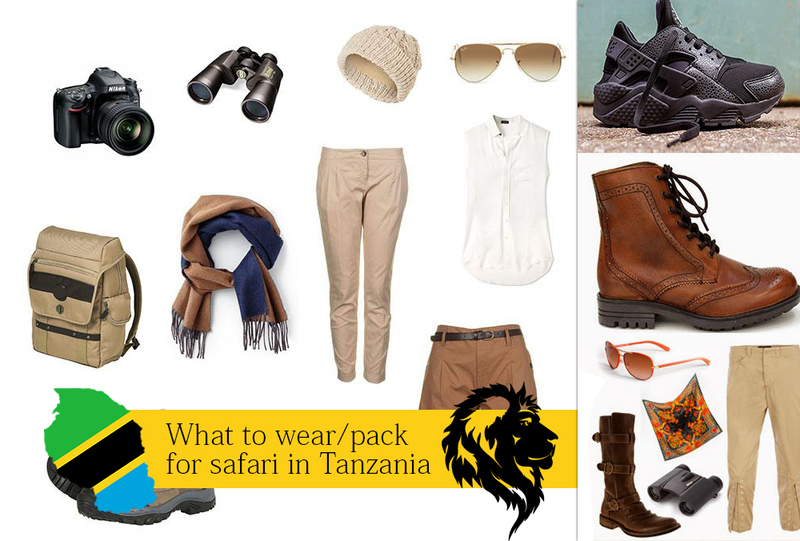 First and foremost, check the local weather conditions during the time you are planning to visit Tanzania. Thankfully for you, Tanzania only gets rain in two months a year, so the weather is likely to be pleasant. This is why it is a good idea that you pack light clothes which can dry quickly and are easily washable. This way, they won’t add much weight to your luggage and you will stay comfortable. If you are planning to hit the beaches of Zanzibar after your safari, make sure you keep your swimsuit with you. As far as footwear goes, you should for a couple of pairs of sturdy walking shoes, which have a closed-toe design and are waterproof. You might want to carry sandals or flip flops so you can relax at your lodging. The walking shoes are for when you are out on a trek or expedition. In addition, make sure the socks you choose are comfortable and not too tight, as wearing them for long periods can cause your feet to swell, something you don’t want as it will affect your ability to walk over long distances.